University of Movieology | Right from Basic Movieology 101! Right from Basic Movieology 101! It is pretty late to take about this movie by now since its already been more than 3 weeks since the movie released and a lot has been said about it. On a general note, the critics gave mixed reviews to this film, and it fell flat on the box office. People, especially young moviegoers made vomit faces while discussing about it. It was declared a flop and everyone criticized the director Vikramaditya Motwane since there were huge expectations from him after his first film Udaan in 2010. He even responded to the criticism saying that he cannot please everyone and will try to take the criticism constructively. But after I saw the movie, my views were completely different from the other people. I loved the movie! I loved it so much that I saw it again. And after seeing it the second time, I feel like seeing it again for the third time now. It remains with me for a longer time after every time I see it. It grips me with a bundle of emotions and I cannot concentrate in normal conversations with people for few hours after watching it. After watching the movie and listening to people talk about it, I’ve analyzed why people didn’t like the movie. The straightforward reason to that is that they couldn’t connect to its story and so they got bored with it instantly. Yeah, I agree that Lootera doesn’t have a mainstream, commercial storyline in proven genres like comedy, horror or romance. Nor does it have those contemporary item numbers or punch lines like Salman Khan flicks that can be marketed for movie’s benefit. So, it is quite obvious that it wasn’t a mainstream entertainer for the masses. Motwane belongs to the same school of cinema as Anurag Kshyap and that school doesn’t make movies to impress the masses or to make the box office go ballistic. They make movies because they love the spirit of movies and so expecting a ‘Houseful 2’, or a ‘Jab Tak Hai Jaan’, or a ‘Ek Tha Tiger’ from him is just pointless. And I am glad that they don’t succumb to that style of filmmaking. I love the type of films that Motwane and Kshyap make. On other note, while you find Anurag Kshyap’s films morbid at times and also a little difficult to perceive, Motwane’s films are beautifully simple and profound. That’s the reason why people appreciated Udaan. It didn’t have any dark story or a riveting presentation; instead it was simple story of a kid from a small town with a dysfunctional family and a short-tempered father. It was a kind of plot that thousands of kids in the country could connect themselves with. It was simple to understand and process it and hence it was widely acclaimed. Lootera on the other hand was also a simple film. But it wasn’t easy to understand and process it since it demands a certain level of maturity from a viewer. You need to have felt a few things in life to understand the story of Lootera. As it was told for the Great Gatsby movie, not everyone can connect to it. Only those who have encountered unrequited love in their relationships can grasp stories like this. For others, it is just people doing crazy things and taking illogical decisions. For example, in Lootera, you see that Ranvir Singh’s character Varun comes back in Sonakshi’s character Pakhi’s life and the only logical step it seems for normal people is that Pakhi calls police and gets Varun arrested or kills Varun herself. But she doesn’t do so. She tells Varun that she thinks about doing it and then a dilemma hits her and she doesn’t do either of it. This is where Lootera looses most of its audience and only people like me remain connected to it. But remaining connected to it and following it, pays off in the end beautifully. Motwane treats us with one of the best climax moments ever. A kind of moment that leaves you in a sea of emotions and you walk out of that movie with a smile on your face. When I watched the movie for the first time, I didn’t know anything about the movie’s making, so I enjoyed it thoroughly! I knew that the two couldn’t end up together, and that’s not the purpose of true, classic love anyway so that didn’t matter. The only thing that mattered was how much love they had in their relationship for each other despite all odds. The last 5 minutes of the movie doesn’t have any dialogues and those are the best moments of the film. What could be better than a director treating you with a superb story and ending it with a beautiful finale without saying a word! Hats off to Vikramaditya Motwane! Later on, I came to know that the later part of the movie was partly based on O. Henry’s story ‘The Last Leaf’. I read the story and I feel that The Last Leaf was less interesting compared to Lootera. This is because of the element of love makes everything more interesting. Lootera uses the plot of The Last Leaf beautifully to come up with a unique story that touches your heart. All those who didn’t find Lootera interesting, I just feel sorry for them. Perhaps its because you don’t know the importance of having someone in your life, who paints a leaf and ties it to a branch on a tree everyday, just because it is important to you and you believe in it. I GOT TO SEE HITCHCOCK! Wow, I just cant express how happy that made me. It was such an enthralling experience. Perhaps, its movies like this that makes my favorite activity of watching movies turn into a passion sort-of like addiction. Ever since I had seen the trailer, I was mad about this film. I would have done anything to get a glimpse of this picture and luckily my prayers turned out true on January 30, 2012! Frankly speaking, I have seen 3 movies directed by Alfred Hitchcock himself, namely Vertigo, Rear Window & North by Northwest (I have his Notorious lined up next to be watched, among his creations). So, I was aware of who the man Hitchcock was and what he had accomplished in his time. But I hadn’t got a chance to see his Psycho and therefore I wasn’t aware much about that movie and the story about its making. This movie is about that period of Alfred Hitchcock’s life when he was making Psycho. And my god, what a ride that was! It was an amazing story in itself. I am wondering why did it take so long for Hollywood to tell this story in form of a film? It should have been done long ago. Even the book, from which the movie was adopted, was there with us since 12 years. Anyways, I am just glad that this story was finally told and we were able to relive that story all over again. The movie tells so many amazing facts that several Hitchcock fans might not know of. The character of Alfred Hitchcock is crafted with superb attention to details and is implemented with perfection by the great Anthony Hopkins. I would have never been able to imagine Hopkins playing Hitchcock. But when I saw him on the screen, I was completely convinced with the way he delivered it. Perhaps it was a great transformation by makeup artists as well. In the trailers I couldn’t recognize that it was Anthony Hopkins. But it was undoubtedly a superb performance at the end. I liked it so much that I would put it in the 2nd spot of best roles this year, after Daniel Day Lewis’ Lincoln. It was sheer joy watching Hopkins play Hitchcock. Hitchcock is one artist we all admire, the artist who was so captivated and intrigued by his work that he had fantasies about his characters. His involvement was so profound that he would be able to bring those things to life that other people couldn’t imagine even on their best days. And Hopkins delivered something that was at par with the name Hitchcock. Perfect accent! Perfect dialogue delivery! Perfect impersonation! Hats off to you sir! 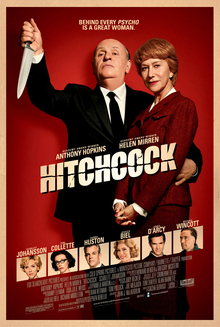 The other thing that impressed me apart from Hitchcock’s character and Hopkins’ portrayal is Helen Mirren’s portrayal of Alma Reville, Alfred Hitchcock’s wife and soul mate for life. Her character was one of the most beautifully written female characters I’ve come across in films this year. It had such grace, poise, and a unique charm. She was subtle but had her firm voice of her own. She was completely aware of what she was doing and what sort of relationships she was surrounded with, but yet she was brave, strong and took steps to explore her boundaries and make her identity. And even in doing so, she never got arrogant and lost her modesty. She exactly knew what it was being Alfred Hitchcock’s wife and she played it absolutely perfectly. Any other woman in her place would have broken down, crumbled and would have left the man. But she didn’t, and thus, she was rewarded by the best words which she long to hear for years from her husband, when Alfred Hitchcock says, ‘I will never be able to find a Hitchcock blonde, as beautiful as you!’ She was a real woman! I love women who are real and true. No drama, no hypocrisy, you feel you can talk to her and it would make you feel good. Ah, I am a fan! A mad fan! I wish I could find a real life woman like her in my life someday. Coming to Helen Mirren’s performance playing this wonderful woman, it was absolute splendor. She is a genius and I can’t think of anyone else who would have done it better than her. Sorry Meryl, not even you, not this time. I love you Helen Mirren for this performance of yours. She completely deserved her nominations to Golden Globes, Bafta, & SAG awards. There were other great aspects to the movie as well apart from Hopkins and Mirren’s performances. But these two were almost the all-consuming factors and so it was almost impossible for Scarlett Johansson or Jessica Biel or anyone else to make a profound impression. Though I mush say that Scarlett Johansson has done a wonderful job in the shower scene. She delivered great expressions there and for a moment anyone would think that she is really terrified and not acting. But apart from that, the leading pair ruled every scene and they pulled the whole movie on their shoulders. It is currently released only in a few theaters. It’s being prepared to release in several other theaters soon. All Hitchcock fans and hard-core movie lovers would completely enjoy this movie. It would be an amazing experience for you all. For other casual movie watchers, especially here in Asia where hardly 3 out of 10 youngsters would have watched Hitchcock movies would know him, it wont be an appealing movie. It would be just another movie for you guys. But personally for me, I am going to treasure this for life. It was a superb film! For tonight, I had to choose between 2 movies, Game Change and Hitchcock. I was very much leaning towards choosing Hitchcock but finally went for Game Change. 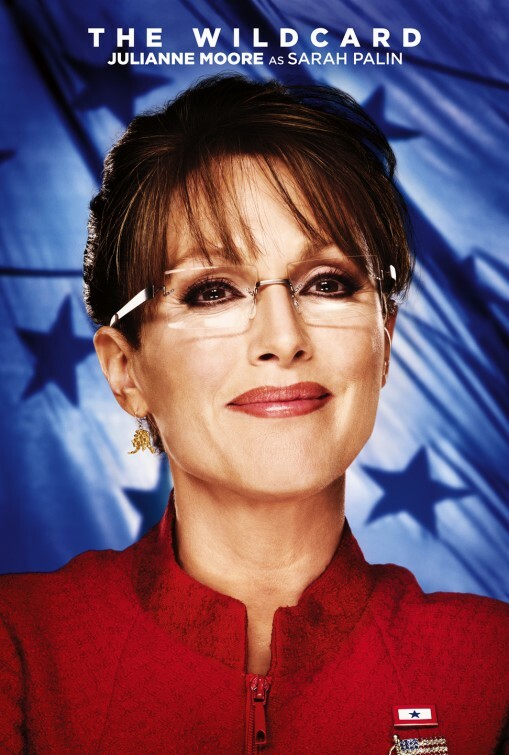 The film is about the 2008 McCain-Palin campaign of the Republican Party. I have recently been attracted to United States politics and films and TV series related to it. I have certainly loved watching political dramas way more than other contemporary genres. I can very clearly remember when I recently watched movies like The Ides Of March, Frost/Nixon last year and Spielberg’s Lincoln this year. Though, I know, Lincoln was not exactly a political drama, it was a biopic, but it was so American, if you know what I mean. Anyways, coming back to Game Change, I had not followed the 2008 campaign when it happened, as I was in college back then and we were just informed casually by our local media that Obama won because he is cool and McCain lost because he wasn’t that cool. So, that was it for me and others back then. But now, since I have grown up and understand things, I was eager to know what exactly went down in McCain-Palin campaign in 2008. So, I start the movie and its action packed right from the first minute. The drama is properly maintained and the story runs in steady pace. The tension, the pressure, and the gravity of the matter are depicted with utter brilliance. A few years ago, I had seen a Canadian mini-series called Trojan Horse which dealt with US Presidential elections and thus I had an idea of how the picture is when the actual campaigning is going on and then later on I learnt about presidential debates, and other events that occur prior to the elections. I liked the whole process. Also, last year, a series called Newsroom written by Aaron Sorkin educated me a lot about the Republican Party. So, today when I watched Game Change, I could understand every single detail, all terminologies, and the actual scale of risks that are taken by those people. Thus, in my opinion, the film was perfectly balanced and wasn’t made with any intentions to defame Sarah Palin or prove her wrong or anything. Nor did it want to portray John McCain in any wrong manner. It was simply a film about a Republican campaign and politics in general. The talk that campaign managers have at the bar prior to the Election Day in the film says the heart of the message. One of them says, ‘People do want to elect someone like Abraham Lincoln or Thomas Jefferson, but unfortunately its not how it works anymore. Obama and Palin are stars and that’s why they click.’ The quote isn’t perfect but it more or less said the same thing. And that’s what the film said. 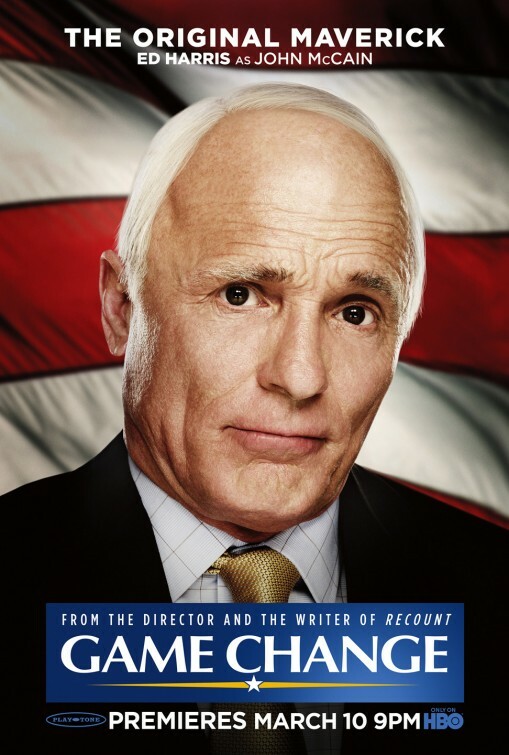 So, I don’t understand why would John McCain and Sarah Palin in their real lives would say that events described in the film are false and inaccurate, when their own campaign chief Steve Schmidt and Nicolle Wallace, chief of Palin’s staff admitted that the movie was highly credible and it captured the spirit and emotion of the campaign. Whatever their reason might be, personally speaking I found the movie authentic and legitimate and I loved watching it as a political drama. 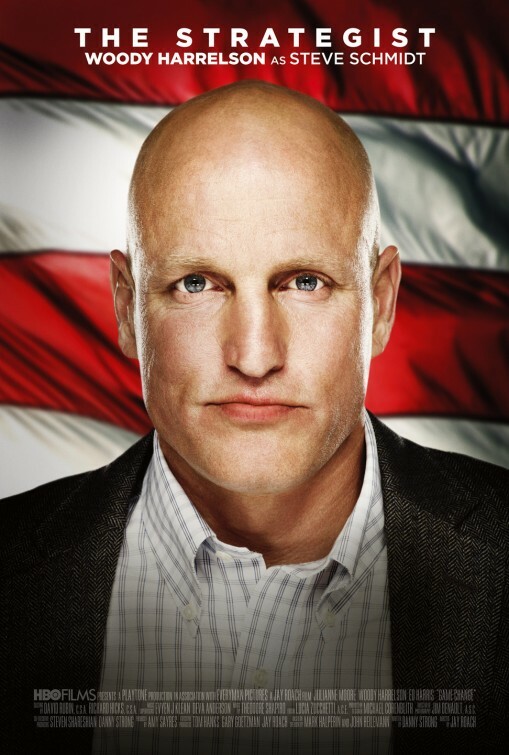 The performances delivered by Julianne Moore as Sarah Palin, Woody Harrelson as Steve Schmidt & Ed Harris as John McCain, were perfect and brilliant. Moore did deserve all the nominations and awards that she received for her performance. I think even Harrelson should have been duly appreciated for his commendable job. Some of the facts that I came to know in the movie were quite astonishing and to some extent horrific. For example when Palin was being prepared for her one-on-one press interviews, especially regarding foreign policy and the fact that she though Iraq war was due to the 9/11 attacks. I was surprised. But when I came to know the results of the interview, I appreciated the hard work put up by that woman. She really did put up a good fight indeed. After the movie was over, I browsed some C-SPAN videos of actual GOP convention & Vice-Presidential debate on YouTube to see what actually Palin said, and I was surprised again to see the real version. She seemed very confident & perfectly on spot. If that’s what was going on behind the curtains in the Republican campaign, then I must say they had a very good campaign in the end. As we often say that a good book can never turn into a good movie, so I would say for actual events turned into films (Though Social Network and certain other films are an exception). It was a ten-week campaign turned into a 2-hour movie so it did miss out several essential things but it didn’t miss out what was really important. It surely captured the overall spirit of that campaign. I simply loved the film. Do watch it, if you share the same taste of movies as I mentioned above. I wanted to watch this ever since I had heard about it. I wanted to watch it even more than Race 2, and so I did. And boy, did I like it! In a nutshell, it’s a regular, somewhat clichéd, true-to-the-matter, romantic love story with decent acting, decent direction, decent music and wonderful writing. Its good on its own, but many of you would have this big question in your mind – is it better than the team’s previous flick, the cult classic Pyaar Ka Punchnaama? Well, umm… no! It is quite tough to put up something better than Pyaar Ka Punchnaama you see. So, if you’re disappointed, don’t be. Do go for it but with a different perspective. Appreciate the talent in the writer-director Luv Ranjan and buy tickets counting on him. I assure you that you won’t be disappointed. Both the movies are quite different from their roots. Pyaar Ka Punchnaama was fun and we loved it because it was fresh, something new. Aakash Vani is a mainstream romantic film. We’ve had a lot of similar films in this genre in Indian Cinema, so you can predict the story as the movie progresses. But the factor that makes Aakash Vani so good a film is its treatment. There is something in it that gives you a sense of Imtiaz Ali’s charm around it. Right from the first scene, the movie keeps you with it. It makes you smile with its freshness and originality. Hats off to Luv Ranjan’s writing and treatment to the characters. Though the flow of the story seems a bit too quick and haphazard but you still enjoy the ride. The dialogues are really cool, the songs are pitched at perfect moments and they sound good as well. You don’t seem interrupted suddenly when the songs appear, which shows wonderful handling of screenplay. The first half is really good. But unfortunately, like several potentially good movies, this one too suffers from the second half syndrome. Maybe, that’s because the story takes a complete turn and everything changes. The tone becomes grave and gloomy, and perhaps that’s where he will loose the attention from majority of audiences because majority of them would be there just to have a light-hearted entertaining movie like Pyaar Ka Punchnaama. Same thing happened in the half-filled PVR hall where I was watching. People started laughing & mocking at serious occasions and you could see that they were no longer attached to the movie. This was partly because the acting was weak and the presentation appeared naïve. For example, in one scene when both Akaash (Kartik Tiwari) & Vani (Nushrat Bharucha) are sitting at a railway station and they start to cry. It could have been a very strong moment. Akaash hadn’t cried properly for 2 years since Vani left him. He should have poured his heart out. But you just don’t feel convinced by the way they both enacted it. It showed that these guys are new comers and have a lot to learn. Its times like this when the director has to wave his magic wand and show some magic. But Luv Ranjan was badly missed as a director there. Scenes like these sets them apart from stalwarts like Imtiaz Ali, Rajkumar Hirani, Yash Chopra, etc. who make their audiences weep along with their characters. But it wasn’t complete crap. It was good. A touchy fellow like me wouldn’t mind all that. The thing that made me like the movie, despite its weak treatment, is the story and its respect for reality and being true to the matter at hand. Its not a love story where in a girl dumps a guy because she made a stupid promise to god and the guy starts defusing bombs in Army in order to kill himself but doesn’t get killed by one and in the end they both meet. No, this isn’t crap like that. This story is the one that you can relate to, one that you’ll see happening next door. This is a part social message, part entertainment film from where I see it. It would make an impact on those parents standing at the crossroads of 2 generations – their and their children’s. This movie would tell them their kids’ side of story. But its not all social message and teachings, it’s a cocktail of fun, drama, romance and practicality stirred a bit carelessly and served. Had it been stirred properly and served with a proper garnish, it could have caught up to become a mainstream movie that would give Race 2 a good run for its money. Talking about acting, it was good for both Kartik and Nushrat. Their previous roles in Pyaar Ka Punchnaama were relatively easy to portray, I’d say. But these characters were a bit more complex to justify. They had more shades and diverse emotions and they justified them pretty well. Kartik is noticeably good in the first half playing the fun guy and Nushrat comes out more mature in the second half wonderfully expressing her character torn apart in keeping up her marriage. The dialogues are good. The conversations seem genuine and not made up which helps in generating a tempo. If this film had a big banner attached to it and A-listed actors, I am sure it’d have been a huge hit. Not having a crowd puller will commercially affect them a lot. It was a good decision to repeat the same pair from Pyaar Ka Punchnaama; otherwise a fresh pair would have made things even worse. But one thing is for sure, now onwards Luv Ranjan wont need introduction in film industry and nor would Kartik and Nushrat. I just hope they have good agents with them, like the ones Ranvir Singh has, that can give them A-listed films with A-listed players. It’s a very important factor to make your place permanent in this industry; otherwise surviving without a godfather is extremely difficult over here. I am so glad I chose this over Race 2. I read a couple of major critics’ verdicts on Race 2 and it is exactly what I expected. I haven’t seen that movie but there is one thing I can tell you for sure – there is definitely more as movie in Akaash Vani then there is in Race 2. People who can spot and appreciate talent would like this film, for others who just like things that sparkle, go for Race 2. But better know what they say about things that sparkle. After seeing the promos for this movie, I was quite impressed with it and had a lot of expectations with it. I don’t know why but this flick had a different vibe to it then other movies that I’ve seen earlier, like, Disclosure (1994), Crash (2004) or Akshay Kumar’s Aitraaz which were heavily focused on sexual harassment. I felt this one would have some edge to it that would set itself apart from others. Maybe it was because of the very fresh leading pair starring Arjun Rampal and Chitrangada Singh and the story focused on a complicated relationship manifested in a corporate backdrop. And it sure didn’t disappoint me throughout! I am not saying it was a blockbuster or I felt changed after watching it or something, but it was presented in a very good way and my expectations felt quenched. I did get my money’s worth. When I saw Arjun and Chitrangada together on screen, I was convinced that there couldn’t be a better pair for these roles. It was a perfect cast! I can’t seem to get any other alternatives that would have been fit for Arjun’s role. Actors like Hrithik, Ranbir, Saif, Akshay Kumar, etc. seem too refined and overtly-big imaged stars for this role and I’m sure you’d have not liked Shahid, Imran, Ranvir, John, or other youngsters as a CEO of an advertisement agency for over a decade. Plus, Arjun’s body language has that sense of victim syndrome, which makes him perfect to portray a character accused of sexual harassment. Also, it had been more than 2 years since ‘We are family’ where Arjun last got a chance to act in a solo-hero movie, so this would have been big for him and he would deliver his best. While, on the other hand, Chitrangada is on her very successful 2nd innings in this industry. But somehow, her movies until now weren’t quite hitting the perfect spot. I missed watching her ‘Yeh Saali Zindagi’ and in Desi Boyz she didn’t have to do anything else except looking pretty. A lot of people, including me, were in thoughts and asking whether she will plunge herself in completely commercial movies or will we get a glimpse of the Smita Patil lookalike talent which we witnessed in ‘Hazaaro Khwaishein Aisi’. Well, here we got a mixture of both. Chitrangada had previously worked with director Sudhir Mishra twice in Hazaaro Khwaishein Aisi & Yeh Saali Zindagi so this wouldn’t have been new for her. Both of them delivered their parts well and thus the film came out well on the whole. Another delight of the film was its music. I enjoyed what Shantanu Moitra did for this film. I am a big fan of Swanand Kirkire’s lyrics and songs and I loved 3 major songs from the film. Darmiyan and Zindagi ka karobar blend perfectly in the progressing storyline and compliment the presentation, thus helping in elevating the ambience of the film. I am glad that they were sensible enough not to go for any item numbers or dance numbers and paralyze the flow of the story. This is the result of sensible people making a movie and caring for what they make regardless of how its outcome would be commercially. I know, Inkaar would only last till Race 2 doesn’t burn it down. Arjun Rampal has never been able to carry a movie on his own they didn’t have Vidya Balan in the cast, nor did they have a killer script, so it all of us knew that this wasn’t going to be a big hit. On the top of that, the movie wasn’t released overseas. So, this wiped its chances of earning from there as well. Despite knowing all this, they cared to make a good movie, and I appreciate them for this. The dialogues are fresh and catchy, and they need to be. The subject of the movie requires the dialogues to be bold and strong. The story is also innovative in its own way. It is more than just sexual harassment. It’s a corporate drama with an edge. I am glad this story was made in a movie and this part of our society was addressed to. It needs to be addressed badly what type of culture goes on in corporate offices today. There are lots of unquestioned, unanswered things going on around us where we work. It feels sometimes that all of that is becoming a major part of our lives without we consciously trying to acknowledge its existence around us. The story though, is bit of a cracker as the movie approaches its climax and is about to end. No one would have expected that Arjun Rampal’s character would be in love with the very woman who had accused him. But I guess that’s the heart of the film. The director wants us to focus on the confusing office relationships and the politics that goes on among fellow-colleagues. In our professional lives, we come across several such scenarios wherein relationships get strained due to external factors and complex circumstances. Rahul & Maya’s relationship was something like that. Before it could blossom into something beautiful, other people contaminate their relationship and both of them are left with prejudice at their ends. Thus their feelings remain suppressed and are never able to surface. Complex thing to digest but still better off to end the film on that note since they didn’t have any room for the classic happy-ever-after Bollywood ending. One more thing I felt was that Kanwaljit Singh’s character as Rahul’s father, could have been written better and shown to have a better effect on Rahul’s character. They have tried, but it couldn’t connect the dots and you don’t feel the connection. On the whole, it’s an average film for a weekend, certainly better option than Mumbai Mirror. I was very disappointed watching Broken City as well, so this served as a delight to me. I hope you find it entertaining as well. Holly cow! This is something fresh man! This is something completely out of the blue. I couldn’t stop laughing watching this trailer. This one definitely tops the my waiting list of must watch Hindi movies. I will definitely watch it the day it hits the theaters. There is something that attracts me towards such underdog Bollywood comedies and drama and this is simply superb. It has no big names, no unnecessary caricatures, its straight to the point and honest film. I am sure I’d love it. All in all, as everyone expected, it’s a full-fledged, Hollywood studio movie. Its not the one that will be remembered for ages or the one that will bag lots of Oscars (it will surely win an Oscar for special effects though), but it will definitely score at least 9 out of 10 in the entertainment department. I will explain later, on why not 10 of 10. But if you’re the one who enjoys movies like Transformers, or Spiderman, or any other movies which are made using computers and where almost everything explodes, you should have watched Avengers by now. And for Iron Man fans or Hulk fans, if you haven’t watched it yet, your life is pointless. As a part of homework, I hadn’t watched any Hulk movies (yeah, I know that’s bad), or read the comics of Avengers. So, I was completely at the mercy of the scriptwriter on how they would present a story where they can assemble 6 self-centered super heroes and make them form a team to fight alien terrors. And I think the story was pretty good. It was depicted quite well. The story transcends quite well from the individuality of super heroes to forming a team of Avengers, and the moment from when they start working together as a team, you start screaming with joy. You have to wait for almost 80 minutes to see them in action together as a team. But trust me, the wait is worth it. It is just last half an hour of the movie that will take you to the best roller-coaster ride of your life. Every superhero is presented at his best. Captain America is shown, as always, jumping into any fight he can, even though if he has no chance to win. Even though there were more powerful superheroes in the team than him, he clearly makes his mark. Iron Man is charismatic as always. If you think that last time when you saw him put on his suit on Monaco race track, in Iron Man 2, was awesome then you’re in for a whole new level of awesomeness this time. This time when you will watch him put up his suit, in air; I guarantee that you’ll pop your eyes out and scream, ‘OH MY GOD!’ It was the coolest thing I saw in last few months! The Hulk is mind blowing as well. All Hulk fans will get their money’s worth watching this movie. His strength is unfathomable, his scream can bring Tony Stark back to life, and his punch can stop an entire alien dragon. And the moment when he thrashes Loki, I observed that the entire cinema hall was cheering at the top of their voices. Thor is presented a bit laid back or a bit reserved. His entry in the film is very good but later on the demigod faces hard time even fighting Iron Man. In his dedicated movie before the Avengers, Thor was shown to have god-like powers. Considering that, he should have been depicted as the most powerful of the pack. But Iron Man and Hulk steals the show from him. But still he’s good. The remaining two superheroes or I should say just heroes were Hawk eye and Black Widow. They were excellent soldiers for sure but they didn’t have any super powers like the other guys. But they still managed to put up a nice show. Hawk eye is amazing with his arrows and Black Widow or Agent Romanoff, as I should address her, is a treat to watch. She is the cherry on the super-cake. Every frame of the movie is enriched just by her presence, no matter if she fights somebody or just talks on a telephone with someone. Apart from that there is nothing else noticeable in the movie. Just these 6 people carry the entire film on their shoulders. It was a superb piece of entertainment! The only part that stopped me from giving it a full 10 is the background music. It lacked a Hans Zimmer touch. It needed to be louder and more aggressive to increase the entertainment quotient of the movie. And the other thing, apart from the background score, was, women. There was hardly any space for them in the screenplay. Scarlett Johansson had to work really hard to make herself noticeable in the film. And yeah, there was Cobie Smulders as well in the movie. I almost forgot to mention her. That’s because she was there only to fire some gunshots and say a couple of dialogues, that’s it. More women in action and a killer background score would have made this movie an epic. But hey, its still is an epic for us fans! Just go and celebrate it. After watching ‘The Vow’ recently in the theater, I was tempted to watch more of Channing Tatum in romantic flicks. I was starting to expect more out of him and I started to think that he could be an amazing actor for serious romantic films. Just then, a friend of mine gave me a DVD of Dear John and WOW! It was an amazing film. I wonder how I missed this movie for so long. The story of the movie is basically adapted from a novel of same name written by Nicholas Sparks and I have not been able to read any of his works but I have watched 3 movies adapted from his novels, namely ‘A walk to remember’, ‘The Notebook’ & ‘The last song’ and the first two of them are among my all time favorites. So, I was expecting a very good romantic movie out of Dear John. Critics and reviewers have often criticized works of Sparks saying that they are way too emotional and sentimental. They say that he desperately writes characters that would make young girls weep. That’s true to some extent but I don’t find it entirely true. His characters do have some depth and an essence of reality. I know, those of you who have ‘The lucky one’ in mind won’t agree with these words of mine. But speaking of Dear John, I found the character of John Tyree very real and heartfelt. John’s relationship with his father is the part that touched me the most. It was captured with great poise and the director Lasse Hallstorm did perfect justice to it. I could feel as if I was reading the book. It is very close to the heart and it grips you around it, and the major credit for that spellbinding effect goes to the actors Channing Tatum and Richard Jenkins. I’ve always admired Jenkins as an amazing actor; Tatum too was equally impressive alongside him. Both of them together can make you forget the world around you and take you along with them on an emotional ride like never before. The romance between John and Savannah is equally wonderful and stays the USP of the film. The on-screen chemistry between Channing and Amanda is really wonderful and picturesque. I found it better than it was with Rachael McAdams in ‘The Vow’. So, has Tatum degraded as an actor or was he actually less comfortable co-staring alongside McAdams than Seyfried remains to be seen. I would go with the latter option though. The romance is real and warm. You feel connected and convinced. When the letters start, you’d expect the story to get stagnant and monotonous but it doesn’t. On the contrary it turns out to be the main storytelling and character-expanding medium. Excellent work! The letters are amazing. It does look a bit old-fashioned long distance relationship between a soldier and his beloved but I find it extremely beautiful and romantic. I am still passionate about old-fashioned romance and letters are still one of my favorite modes of expressing one’s feelings. So, full marks there from my end. The only part of the story where I feel less convinced is when Savannah decides to marry the single father, who is her neighbor, because he is dying and has no one after his son. I think that the part where Savannah starts getting second thoughts to where the relationship is headed, is not portrayed with enough importance. I am assuming that it would be explained aptly in the novel but the director didn’t have that luxury. But still it is not that ugly and pathetic. It is still fine and doesn’t ruin everything. The last letter that Savannah writes to John, after Tim passes away, is a home run and seals the victory. You end up being completely moved as the ending credits start rolling. If you’re a person who loves sentimental movies and if you can connect yourself with the story being told, trust me, Dear John will make your eyes wet. It is an emotional odyssey that you’d not want to miss. It doesn’t have the romance of The Notebook or Titanic that will make your knees weak, but it’s the entire story, the characters, and the presentation that will make you take a dive in the ocean of tranquility. You’ll feel liberated and enriched. I feel sad that I missed it for this long. I highly recommend it to all of you, who have missed it so far like me, and who believe in whatever I said here. Awesome experience! Just came across this trailer and my God, that’s an amazing trailer. Great stunts! Joseph Gordon-Levitt is getting more amazing after every movie he makes. I am yet to watch his 50/50. Last time I saw him was in Inception and he was great there as well. This year, I look forward to this movie and also in The Dark Knight Rises. But this one pretty impressive. Its been quite a time since he ran the movie on his shoulders alone. Can he carry this one? I had just seen the poster of this film before I went down to watch this movie in the theater. I couldn’t get a chance to watch the official trailer and make pre-assumptions about the movie. But according to the poster I came to know that the movie had Channing Tatum and Rachel McAdams in the lead roles and it was based on a true story. Then a little bit of googling gave me more information about the movie. It was a story of a husband and wife and they meeting an accident. Wife suffers from memory loss and husband tries to recall her memories and their vows. It sounded like a strong plot and when it says that the movie is inspired from true events, it gets more attention from me than regular fictional stories. I was definitely excited in seeing what this movie has in store for me. When I reached the hall, I was expecting a sort of a romantic film like Adam Sandler’s 50 First dates; a little serious though. I had thought that it would have a warm romance that would melt my heart as I had learnt that the movie was a huge hit in North America and it was really doing well during Valentine’s Day week. So, I was expecting a very touching, romantic film. The film starts off with their accident and the film moving back and forth between current timeline and past events. It builds up very slowly. Initially I couldn’t feel connected with the characters. I felt that Channing and Rachel weren’t too involved in their roles. I felt that their acting was dull. The dialogues weren’t strong enough to make your girlfriend lean her head on your shoulder. But I guess, the director and scriptwriter wanted to keep the things real, and keep the essence of the story intact, and didn’t try to ruin it by making cheesy. No problem, I can live with that. The first half passes and Rachel’s role develops wonderfully. Character of Paige has shown a lot of depth than in the first 30 minutes of the movie. Now, you start feeling connected to the film. You can feel that confusion that Paige feels when he looks at Leo, who claims to be her husband. But she remembers nothing about him. You can feel her trying her best not to hurt him. Even Channing’s character picks up the pace and develops as events start happening. Channing beautifully portrays Leo’s helplessness, which he feels when his wife leaves him out. You can feel Leo’s agony and frustration when he is cut off by the love of his life, as she remembers only the period before she met him. That awkwardness is well displayed between a husband and wife who were soul mates a while ago but have to live as strangers now. As the film ends, it leaves me with a very nice impression. I really liked the movie. I liked it because it was different from traditional, conventional love stories that Hollywood filmmakers and fictional novelists have been making over years, that sometimes bend the reality to the extent of making it impractical. I liked it because it had a lot to do with reality. Being inspired from a true story was the biggest virtue of this movie and it carried on it quite well. Movies like this should be made more often, as it leaves a proper impression on current generation. Life is not perfect, and one should take it as it comes to you. A wonderful film! The music is good and Channing really convinced me that he can act and he can act well. I am definitely booked for his 21 Jump Street, which is yet to release here in India. As for Rachel McAdams, she is always a delight to watch. I have never been disappointed by her performances. But she definitely looks a bit aged in this one. In all those frames with Channing, she quite eminently looks older than him. All in all, it’s a good movie. You can watch it one time if you like romantic films. You will be able to stand it just fine. If you like movies which are modest, real and whose scripts don’t try to act smart, you’ll love this movie.